Looking for the best possible deal on Snowmass lodging? Look no further! Select one of our last-minute property deals tailored to suit the deal seeker in you! The ultimate mountain getaway is calling and is located just one mile from Two Creeks lift. 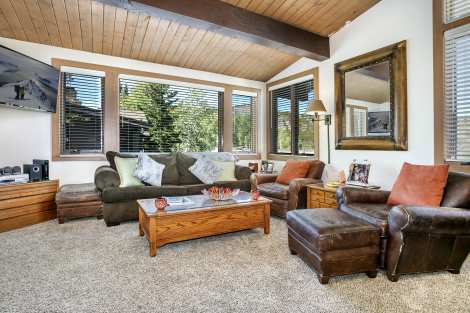 This town home boasts lots of natural light, beautiful mountain views and plenty of space for 9 guests. Enjoy the crisp mountain air from one of the 3 private decks while grilling out on the gas BBQ grill or while sitting in the secluded hot tub. Space abounds with 3 bedrooms and 2.5 baths featuring a Master bedroom with King bed, guest bedroom with queen, second guest bedroom with queen and den including a twin sleeper sofa. Relaxing in the large living room with vaulted ceilings and custom stone wood burning fireplace is perfection at the end of each day. The bright and spacious kitchen is well-appointed and boasts a breakfast bar adjacent to the dining room. Lots of entertainment amenities, with DVD players, stereo, flat screen TV and a baby grand piano for the music lover. This town home offers everything vacationers could need for their Snowmass vacation. 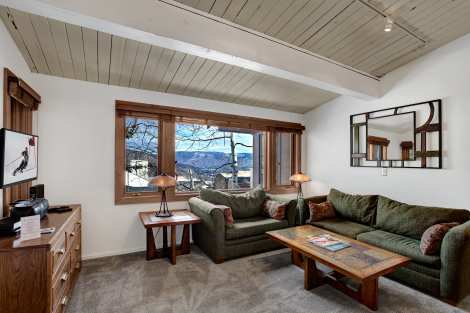 Fully renovated in 2016, this 2 bedroom, 2 bathroom Snowmass Mountain condo will take your breath away from the moment you step through the door. Sprawling mountain views, dramatic vaulted ceilings and prime location combine in this stunning, top floor, remodeled Snowmass Mountain Condo. Enjoy the modern kitchen design with sleek granite counter tops, glass tile back-splash & new stainless steel appliances. Gather with family & friends in the dining room that can accommodate up to 7 guests. 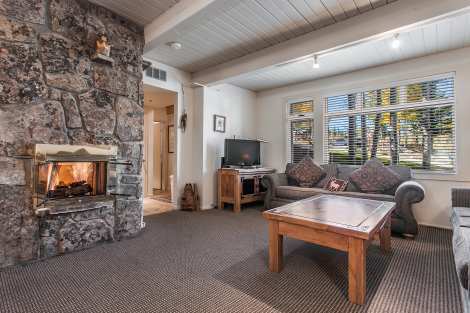 Enjoy the bright and spacious living area offering guests a stylish yet comfortable space complete with flat screen TV, mountain style furnishings, full sleeper sofa and an eye catching wood burning stone fireplace. Two of the three bedrooms can be found on the main level, one featuring a Queen bed and the other offering two Twin beds. A full bathroom sits in the hallway just outside the bedrooms as well as a washer and dryer. The second level of the condo is a dedicated master suite where guests will enjoy a King bed, en-suite bathroom, sitting area and a continuation of the vaulted ceilings with exposed beams and windows that complete this comfortable, bright space.After a fun filled day of Snowmass activities enjoy a relaxing evening taking in the spectacular views and barbecuing from your private balcony. 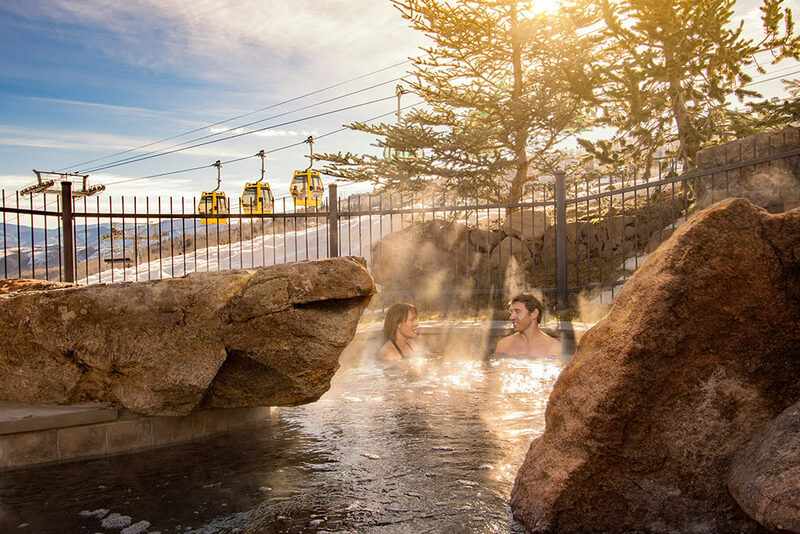 Head downstairs to take advantage of the many amenities offered at the Snowmass Mountain Condominiums including the common area hot tub, outdoor heated pool and sauna. Conveniently located about a mile from the Snowmass base village and with a shuttle stop just outside your door, getting around is a breeze! One guaranteed parking space, which can fit 2 small to medium cars or 1 large vehicle is included with this property. With the open floor plan and a total sleeping capacity of 7 this spacious condo is perfect for families or small groups. Contact one of our local Snowmass reservation specialists today to start planning your next getaway. This is what ski vacation dreams are made of! This chic Rocky Mountain Retreat truly has it all. This home boasts high-end finishing’s, ultimate ski in/ ski out convenience, privacy amidst the trees & everything else your ski dreams consist of. Room to sleep sixteen guests, this vacation hideaway is ideal for multiple families traveling together, a group of friends or small corporate retreat. The large great room centers on a custom stone fireplace offering the perfect crackling soundtrack for chilly nights spent in. The open floor plan offers ideal flow from the kitchen, to dining to living room space; perfect for entertaining. The master suite is a true retreat with chaise lounge and window seat for lounging. The bunk room is a kid favorite, while the additional guest spaces are ample and well designed with the comfort of each guest in mind. An expansive deck is the ultimate warm weather place to relax with large dining table, gas grill and private hot tub. The bathrooms offer additional means of relaxation via multiple jetted tubs and steam showers. The kitchen is beautifully appointed and offers granite counters, high-end appliances and everything a chef could need to whip up a gourmet meal, or relaxed family meal. Understated elegance, contemporary lines and a true appreciation of what guests need to create the perfect Rocky Mountain vacation have all come together in this Snowmass area accommodation. 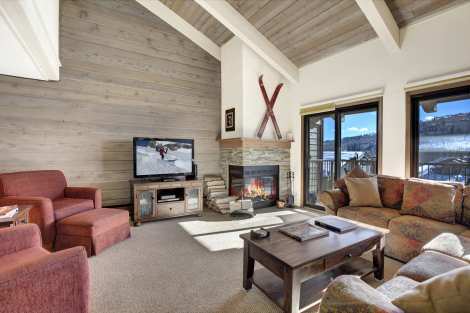 This premier Interlude condo in Snowmass is the perfect ski-in/ski-out property. Drop your gear in the well-placed mud room & get cozy by the fire. Decked out with leather furniture, granite counter tops throughout & modern bathroom finishes. Interlude 308 is situated on Fanny Hill, a green run which will take you to Base Village. There you will find the Gondola, Children’s Tree House Ski School, shops, restaurants & more. This condo has it all beauty, convenient location & plenty of space for 10 with 3 full bathrooms, 2 King beds & 2 Bunk beds. The unit also includes a washer & dryer for your convenience. The mountains await! This quintessential Rocky Mountain retreat is perfect for a large family or group of friends. This superbly decorated condo has three bedrooms and two stories with a living area on each floor. There are two bedrooms downstairs - one with a King bed and one with a Queen. There is a bedroom in the upstairs loft with a separate family room, which includes 2 bunk beds and 1 Queen bed. Bathrooms have been redone with custom tile, and the kitchen has been updated with custom granite counter tops, tile back splash, and updated kitchen appliances. The dining table in this condominium seats 6, and the bar seating provides room for 3. Enjoy flat screen TV's in each of the living rooms for prime entertainment. There is a large gas fireplace with custom stone from floor to ceiling for optimal relaxation. An outdoor balcony overlooking the mountains has a grill to prepare afternoon barbecues or evening entertainment.Head downstairs to take advantage of the many amenities offered at the Snowmass Mountain Condos including common area hot tub, and pool. With a shuttle stop just outside the complex getting around is a breeze and this condo’s convenience simply can not be beat! There is also one covered, private parking spot for travelers who choose to bring their own vehicle. 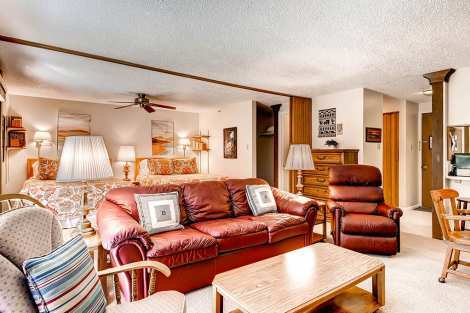 With the open floor plan and a total sleeping capacity of 10 this condo is perfect for families or small groups of travelers looking to explore and enjoy all that Snowmass Village has to offer. ONE guaranteed parking space, which can fit 2 small to medium sized cars or 1 large vehicle. Perfectly finished in mountain contemporary style and brimming with sophistication, this bright and sunny end unit is perfection. An open floorplan allows plenty of room to sprawl out and offers privacy for families traveling together. The kitchen is well appointed and features granite countertops and high-end appliances. 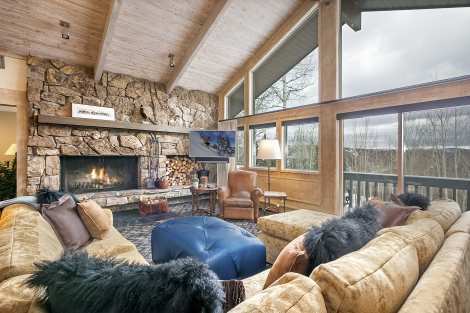 The cozy living space boasts spectacular mountain views and over-stuffed sofas perfect for relaxing. 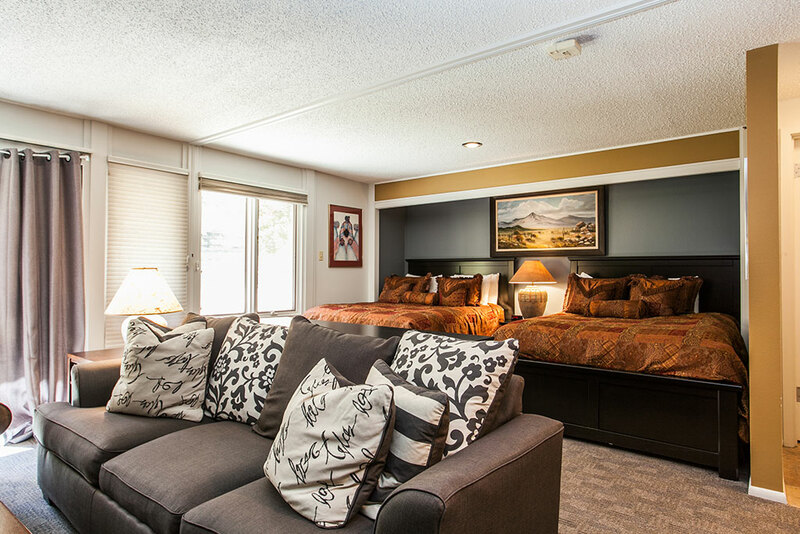 A guest room is decked out Snowmass style with 2 twin beds. Relish the chic master suite with a king bed while the additional guest suite has a queen bed. Refresh in the common area pool, enjoy a brief stroll to Snowmass Village to explore, or whip up a family dinner with the help of a propane BBQ grill on the private balcony. A shuttle is available for your convenience. One covered parking space is available. Looking for an unforgettable Snowmass experience? Tall Timbers Lodge boasts a mountain setting paired with traditional rustic sophistication. 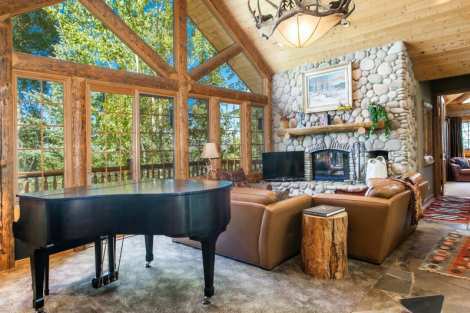 This elegant home presents a sophisticated log home ambiance partnered with perfectly selected custom décor. Each space is finished with comfort in mind while maintaining the perfect balance of form and function. The master suite is gracious and lovely with a spa-inspired en suite bath. 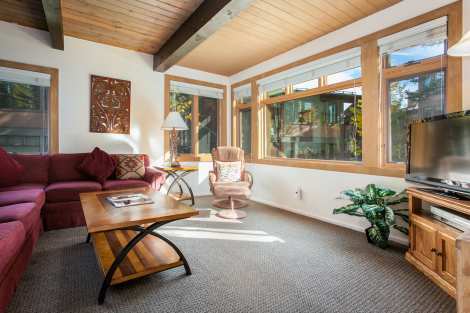 Windows adorn almost every wall offering views of surrounding nature, wildlife and mountains. The bunk room has three bunk beds sleeping six and is the ideal spot for all the kids. This serene Snowmass setting continues to the outside spaces with a patio nestled in to the trees, seasonal water feature and outdoor hot tub. The slopes of Snowmass are only ¾ of a mile away allowing for ease of access to mountain fun. Room to sleep 14 guests, this home is a fantastic find for families traveling together or small groups. Believe us, once you get here, you’ll never want to leave. This charming studio with loft has all the ingredients that make for a fantastic mountain vacation. The unit is equipped with a full kitchen, 1 King bed, 2 Twin beds in the loft space, and a sleeper sofa in the living space. Guests will also find extra bedding in the loft and living area to entertain family and friends.With the convenience of slope-side access, a short three-minute walk brings you slope side and ready to ski or hike. The common area pool & hot tubs are tucked away amidst the Aspen trees, the perfect secluded spot to unwind. Relax in this cozy mountain oasis or take a walk to the mall or a Skittle ride to the Base Village. Onsite laundry facilities are available for guest convenience. This charming studio awaits your arrival, book today! This cozy mountain retreat awaits with room for 5 guests. This well-appointed studio+ loft offers 1 Queen bed, 1 Twin bed and 1 Queen size sleeper sofa. Enjoy beautiful granite countertops & an easy to use gas fireplace. Take a three-minute stroll & you’ll find yourself slope side, ready to ski or hike. The common area pool & hot tubs are tucked away amidst the Aspen trees, the perfect secluded spot to unwind. Relax in this cozy mountain oasis or take a walk to the mall or a Skittle ride to the Base Village. One parking space is provided as well as on site laundry facilities. This Warm & Welcoming 2 Bedroom + Loft Condo will impress everyone in your group. The 2 levels provide privacy while the main level brings everyone together. The main level offers a well-appointed kitchen with proper dining area for 6, 3 bar stools at the kitchen bar, living area with sofa sleeper, flat screen tv & fireplace. Enjoy the mountain views from inside your condo or step out on the balcony for some fresh mountain air, cook something on the BBQ grill or sip on your favorite beverage. Also, on the main level you'll find 2 bedrooms each with 2 Twin beds, full bathroom & washer/ dryer for your convenience. Head upstairs to find a huge master suite with Queen bed & Twin day bed with en suite bathroom. 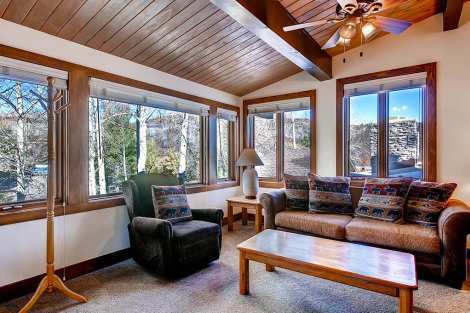 Enjoy the peaceful mountain views while still being close to everything Snowmass has to offer. While staying at the Snowmass Mountain Condos guests can enjoy amenities such as an assigned covered parking spot, a common area pool and hot tub as well as the convenience of being directly on the shuttle route and only a mile from the base of the Snowmass Resort.ONE guaranteed parking space is available. 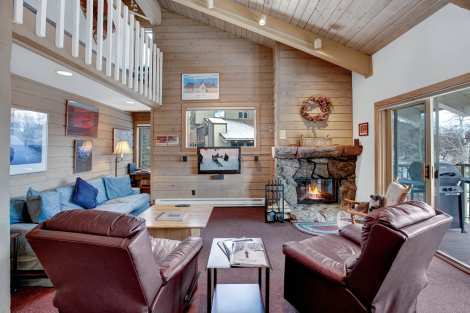 This Lichenhearth studio condominium boasts ski-in/ski-out access, and sleeping arrangements for up to four guests and a sleeper sofa in the living room. Kitchen is fully equipped, with dining table seating for four. The patio has beautiful mountain views and folding walls allow for isolation between public and private areas. Laundry on-site for your convenience. 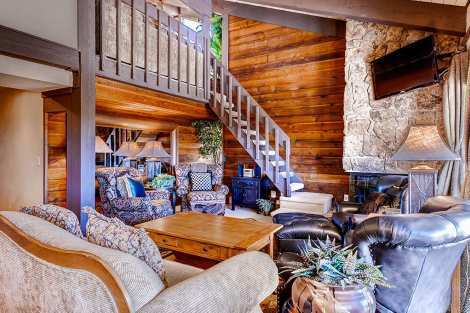 Every detail of this beautifully decorated ski condo exudes mountain sophistication with a touch of rustic charm. Guests will note the perfect combination of wood and stone throughout. Tasteful art adorns the walls providing the perfect finishing touches to this Snowmass Village area residence. The well-appointed kitchen with breakfast bar adjoins the dining room with seating for six. The master suite boasts a king-sized bed, while the guest bedroom offers two twin beds. A sofa sleeper is on hand for extra guests. Curl up next to the fireplace at the end of the day, or head out to the common area pool and hot tub to unwind. Two bathrooms allow enough space for privacy, and a large soaking tub is the perfect spot to rest for adventure weary travelers. Head out to the private balcony for a BBQ on the gas grill or enjoy a walk to Snowmass Village for a night on the town. The location of this Snowmass Mountain Condo is as good as it gets. A short stroll brings guests to the ski bridge, allowing for easy access to mountain activities.While staying at the Snowmass Mountain Condos guests can enjoy amenities such as an assigned covered parking spot, a common area pool and hot tub as well as the convenience of being directly on the shuttle route and only a mile from the base of the Snowmass Resort.ONE guaranteed parking space is available. This Rocky Mountain retreat is sure to impress with all the comforts of home and convenient location. Two bedrooms and two full baths allow for ample space for eight. The updated kitchen is adorned with granite countertops and backsplash with beautiful cabinetry and stainless-steel appliances. Enjoy dinners with family and friends in the dining area located in the open concept living space. 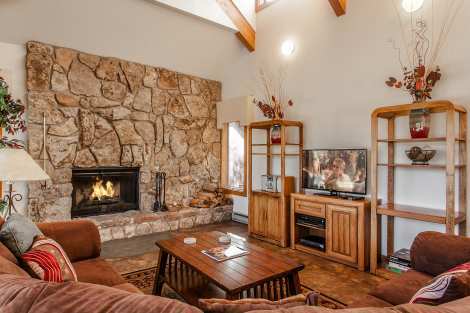 Curl up next to the stone gas fireplace and enjoy the flat screen tv. Master bedroom boasts a King-size bed while the guest bedroom offers a Queen and Two Twin beds. A sleeper sofa in the living room provides added sleeping for family and friends. A washer and dryer are in the hallway of condo for your added convenience. The common area pool and hot tub is accessible during your stay. Curl up in front of the fireplace on chilly mountain evenings or take a walk to the Mall or a Skittle ride to Base Village for shopping and dining. Create a story book mountain retreat with this picturesque four-bedroom, four bath condo overlooking Mount Daley. A spacious kitchen is well suited to both the casual and serious chefs in your group, and the adjacent dining area has room for six guests with additional breakfast bar seating. The living area offers rich wood finishes, custom stone fireplace, and vaulted ceilings. The nicely sized master offers views, privacy and comfort. In addition to the master and two guest suites kids will delight in a fun bunk room. Walk across the road for immediate access to Assay Hill and skiing. Each room is highlighted by their own unique touches; custom cabinetry, wood beam ceilings, well-chosen art – all framed by spectacular views. More than enough room for eight guests, this property is detailed to perfection. Style, comfort and convenience combine in this stunning, top floor, remodeled Snowmass Mountain Condo. Walk in the front door to find a mud area, perfect for small gear storage, then enter the bright and spacious main living space which offers guests a stylish yet comfortable living area with vaulted ceilings, flat screen TV, leather furnishings, Queen sleeper sofa to accommodate extra guests, and an eye-catching stone fireplace. Adjacent to the living room sits a dining area that seats six comfortably at the dining table plus an additional two bar stools at the breakfast bar looking directly into the beautiful upgraded kitchen. Two bedrooms can also be found on the main level of the condo, one featuring a queen bed and the other two twin beds. A full bathroom sits in the hallway just outside of these bedrooms as well as a washer and dryer for guest convenience. The second level of the condo is a dedicated master suite where guests will enjoy a queen bed, full bathroom, sitting area and a continuation of the vaulted ceilings with exposed beams and windows that complete this comfortable, bright space.After a long day of outdoor adventure guests can head back to the condo, located only about a mile from the base village, to enjoy a relaxing evening barbecuing and taking in the view from their private deck that looks out over Snowmass or head downstairs to take advantage of the many amenities offered at the Snowmass Mountain Condos including common area hot tub, and pool. With a shuttle stop just outside the complex getting around is a breeze and this condo’s convenience simply cannot be beat! There is also one covered, private parking spot for travelers who choose to bring their own vehicle. 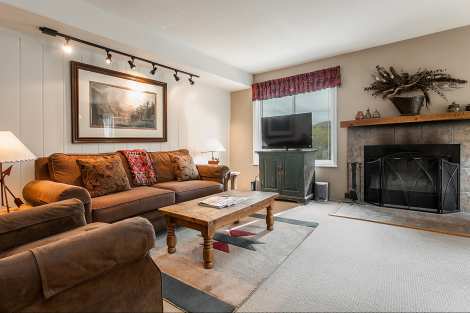 With the open floor plan and a total sleeping capacity of 8 this condo is perfect for families or small groups of travelers looking to explore and enjoy all that Snowmass Village has to offer. ONE guaranteed parking space, which can fit 2 small to medium sized cars or 1 large vehicle. This adorable studio boasts a warm and cozy stacked stone fireplace that will keep you warm and toasty. A charming garden walkway leads you to your mountain retreat where guests will find 1 King bed, 1 wrap around sleeper sofa and full kitchen. A short walk brings you slope side and ready to ski or hike. The common area pool and hot tub is accessible during your stay. Take a walk to the Mall or a Skittle ride to Base Village for shopping and dining. A laundry facility is located on-site for your convenience.Comfort and convenience combine for a cozy mountain escape. Call and book today! Relish exceptional views of Mt. Daley in this beautiful Mountain Oasis. 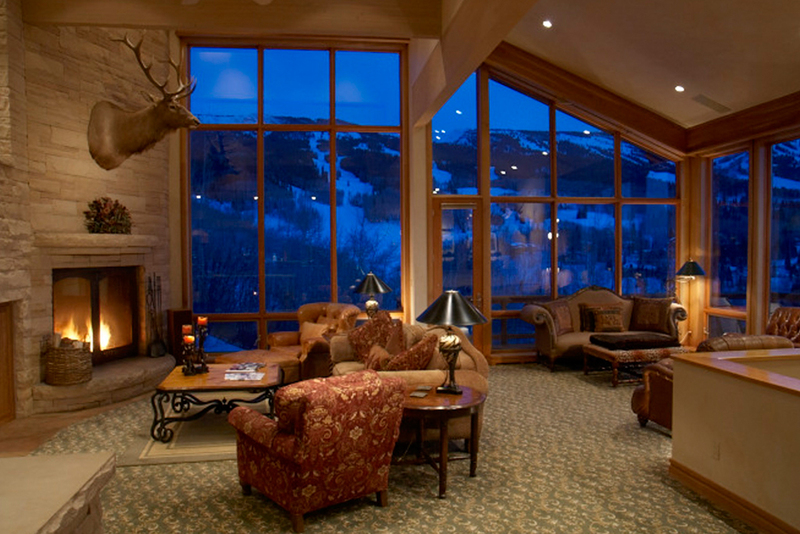 Enjoy Snowmass Village from every window or take them in from your private balcony. A well-equipped kitchen opens to a large dining space and breakfast bar; perfect for family gatherings or entertaining friends. Sprawling out over 2300 square feet, the bedrooms and family gathering area offer ample room. The great room features vaulted ceilings, gas fireplace, large flat screen TV and access to the wrap around deck. Four bedrooms allow for room to sleep up to nine guests, this property is perfect for groups or families traveling together. Each of the four bathrooms has been remodeled and feature steam showers in two of the baths and a jetted tub in the master suite. Just steps outside the front door, guests have access to the free village shuttle that swings by every twenty minutes to whisk you away to the slopes or any location in Snowmass Village. A common area year-round pool and built in hot tub is adjacent to the condo allowing easy access for the perfect après spot. This cozy, 2nd floor two bedroom + loft offers plenty of space for a large family. Each bedroom features an en suite bathroom, even the loft has a private bathroom. The well-lit living room has comfortable lounging areas to enjoy the gas fireplace and flat screen tv. The dining area of this corner unit features a six-person dining table overlooking the court yard. This condo also includes a washer and dryer for guest convenience.The building is closest to the complex pool and hot tub making this one of the most well-placed units in Seasons Four. If you happen to be looking for a Snowmass condo that is close to all the action in the village, allows you easy access to seasonal mountain activities, and provides a comfortable and well-appointed home base for your next Colorado vacation, this Seasons Four two-bedroom condominium checks all the boxes. The bright and spacious living area is highlighted by contemporary white-washed wood walls and is filled with comfortable furnishings perfect for relaxing in between adventures. A wood burning fireplace provides the perfect ambiance for a chilly mountain evening spent in. The kitchen is nicely appointed and offers stainless appliances, granite counter tops and a breakfast bar that seats three nicely alongside the dining table set for six guests. An intimate patio space has a gas grill for nights you just want to stay in. This first-floor unit is easy to access and is only steps away from the common area pool and hot tub. This ideal Snowmass Village area location is sure to be a place you’ll return to year after year. This charming rustic studio makes for a welcoming mountain retreat. Boasting vaulted ceilings, a gorgeous custom stone gas burning fireplace, flat screen TV, and sleeping accommodations for up to four people. Located on the third-level, this unit is equipped with a full kitchen and dining room seating for four. A short walk brings you slope side and ready to ski or hike. The common area pool and hot tub is accessible during your stay. Curl up in front of the fireplace on chilly mountain evenings or take a walk to the Mall or a Skittle ride to Base Village for shopping and dining. A laundry facility is located on-site for your convenience. 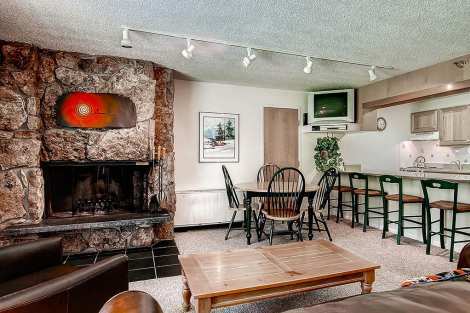 A cozy and welcoming ground level studio awaits guests at this Lichenhearth condominium. Room to sleep four, with 2 Queen beds and a sleeper sofa in this nicely appointed ski-in ski-out unit. Plenty of living room seating for entertaining family and friends, along with a custom stone wood burning fireplace for curling up to during chilly mountain evenings. Kitchen fully equipped, with granite counter tops, bar seating for four, and dining table seating for four. 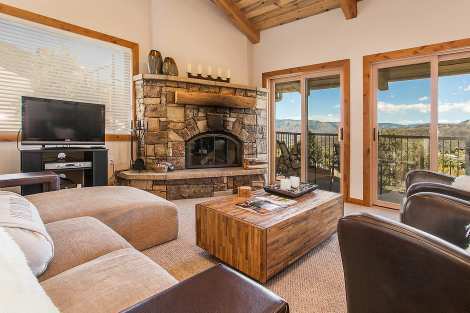 This luxury three-bedroom, 3 bath condo is the perfect location for your Snowmass vacation. The living room boasts some of the most incredible views towards Independence Pass. The bedding configuration includes - Master bedroom with a King bed and an attached den/office with a Twin sleeper sofa, a Queen bedroom with private bath and Jacuzzi bathtub, and a third bedroom with 2 Twin beds and an adjacent bathroom. Amenities include a wood burning fireplace, balcony, gas BBQ grill, a covered parking space for guests, and a washer/dryer in the unit. Guests will also have access to the community pool, hot tub, exercise room and sauna. This fabulous ski retreat guarantees a revisit year after year. ONE guaranteed covered parking space is available. 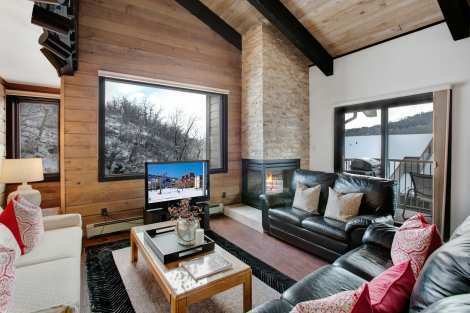 Relax after a day on the slopes in this beautifully appointed Snowmass Mountain Condominium. Located just minutes from the lifts as well as shopping and dining, this stylish two-bedroom two bath condo offers travelers all the amenities of home and so much more. 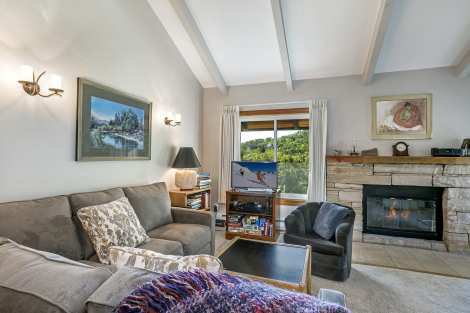 Guests will enjoy a fully stocked and updated kitchen, cozy wood burning fireplace, washer and dryer for guest convenience, private deck with stunning mountain views and gas BBQ grill, flat screen TVs, elegantly remodeled bathrooms, and plush furnishings to top it all off. With one private parking spot as well as immediate access to the shuttle stop and close-proximity to the common area pool and hot tub, friends and family alike will love all the conveniences this location provides. 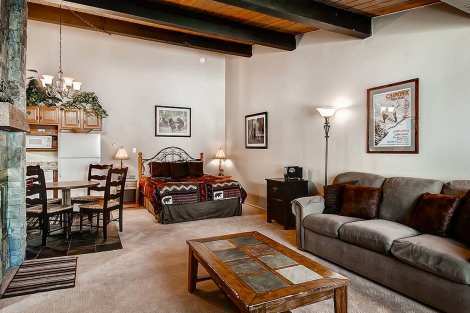 This beautiful condo truly has everything you will need to ensure a relaxing and memorable Snowmass Vacation!ONE guaranteed parking space, which can fit 2 small to medium sized cars or 1 large vehicle. This cozy 1-bedroom, 2-bath condo welcomes your arrival with room to sleep four, with 1 King master suite including a flat screen tv and two sleeper sofas in the living area. 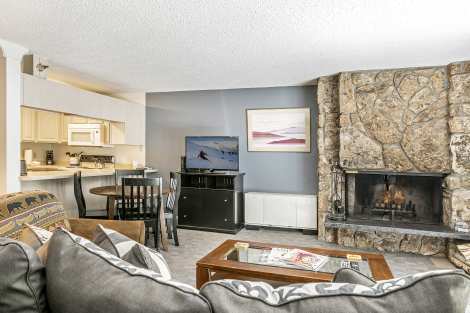 Cuddle up next to the stone gas fireplace and enjoy the flat screen tv. A fully stocked kitchen and dining table that seats four makes meal time easy. A washer and dryer are conveniently located in the unit. A short walk brings you slope side ready to ski or hike or to the Mall for shopping and dining. After a long day of Snowmass adventure relax in the secluded common area pool and hot. 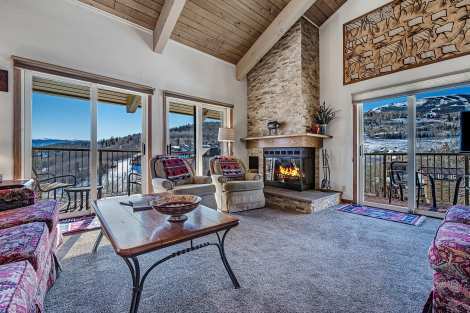 If you're looking for a Snowmass condo that is close to all the action in the village, allows you easy access to seasonal mountain activities, and provides a comfortable and well-appointed home base for your next Colorado vacation, this ground-level Lichenhearth condominium is for you. Two Queen beds with a folding door for privacy, as well as a sleeper provides sleeping for a small family or group of friends. 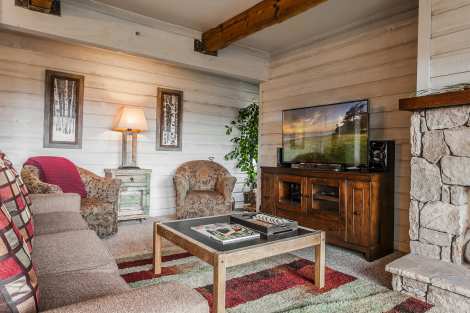 Living room boasts a leather couch and recliner, flat screen TV, stone wood burning fireplace, and patio. Kitchen is fully equipped, with bar seating for two, and dining table seating for four. A laundry facility is on-site for your convenience. Snowmass Vacations has carefully selected an exclusive list of private residences for your next vacation stay. Whether you seek the convenience of ski in ski out or prefer a private residence perched over the Snowmass resort, we have a variety of residences to suit all your needs. Our private homes include access to friendly guest services with emergency service available 24/7. Snowmass Vacations offers a wide variety of private townhomes and condos in the heart of Snowmass Village. Our properties are designed to accommodate diverse groups of travelers who seek premium location with the convenience of more living space compared to a hotel. Many of our accommodations have common area amenity pools, hot tubs and fitness centers on site, as well as immediate ski access for convenient lodging and recreation. 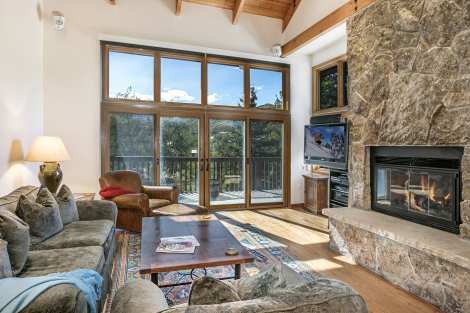 Whether you're looking for Snowmass lodging located near Snowmass Village, slope-side, or a retreat nestled in away from it all, Snowmass Vacations is certain to have the perfect vacation rental to suit your lodging desires. The essence of any adventure is discovering something new. At Snowmass Vacations, our focus is on custom crafting mountain lifestyle vacations unique to each of our guests allowing you to discover the true nature of a mountain vacation. We specialize in helping our guests find the perfect Snowmass vacation homes and Snowmass condos to suit their needs. Snowmass Vacations, formerly known as First Choice Properties, has been an integral part of Aspen Snowmass and the Roaring Fork Valley for over 25 years with experienced and knowledgeable employees that have been in the valley and with the company for about as long. At Snowmass Vacations we specialize in building and maintaining relationships and customizing your vacation needs. Whether you are looking for a private vacation home rental, condo or casual out of the way place for a relaxing trip with family and friends we have you covered. 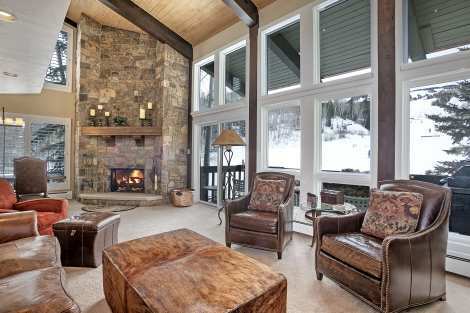 We offer a wide variety of Aspen Snowmass vacation homes and condos throughout the Aspen / Snomass mountain resort area and are here to help you plan an incredible vacation that will bring you back year after year. Discover all that our mountains have to offer with a choice of four mountain resorts all within 10 minutes of each other. Skiing, hiking, mountain biking and shopping is all around you in the Aspen Snowmass area. If you are planning a trip to Colorado, contact one of our vacation rental specialists, and let us plan your perfect vacation! Explore our other destinations and browse our portfolio of properties.